BRP’s 2013 Rotax MAX Challenge Grand Finals (RMCGF) will be held at NOLA Motorsports Park from November 13 to 16, 2013. This 14th edition of the RMCGF will showcase a record attendance of 360 drivers from 53 countries around the world. Celebrating 30 years of Rotax kart engines, the Rotax MAX Challenge Grand Finals will be for the very first time on mainland U.S.A. 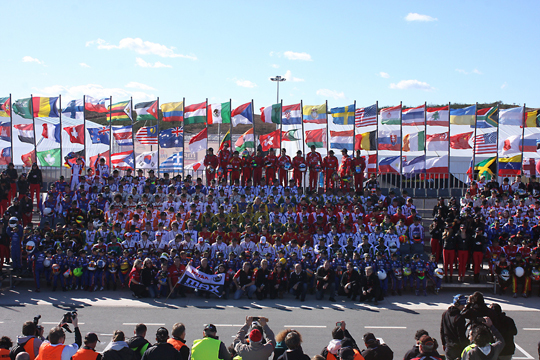 Success is already guaranteed as registrations reached a record 360 drivers, 84 more competitors than the 2012 event held in Portimão, Portugal. The Rotax MAX Challenge (RMC) is a professional kart racing series established, owned and organized by BRP and its Rotax kart engine distributors. Approved by and in compliance with CIK / FIA, the RMC is a "one-make-engine" formula: only Rotax kart engines that are checked and sealed (for equal performance) are allowed. There are four different racing classes for pilots starting from 13 years of age. Each category is supported by a different chassis manufacturer. The success in the competition is mainly up to the skills of the driver and his/her experience in the set-up of the combination of the engine, the MOJO tires and the chassis, provided by authorized RMCGF partners. Vroom International April 2019 out now!